Peru's president says he is indefinitely postponing plans to forcibly eradicate coca fields in the world's top cocaine-producing valley. President Ollanta Humala's announcement in a televised interview Sunday night came a week after he fired his drug czar, Carmen Masias. She had announced in January that a militarised eradication effort – half-funded by the US – would begin this year in the Apurimac, Ene and Mantauro river valley. Critics said that strategy would only help drug-funded Shining Path rebels based in the region turn its coca-growers against authorities, with violent results. Coca is the remote valley's lone cash crop and growers have already mounted protests and threatened resistance. Humala said that while he was not ruling out forced eradication in the valley, he wanted to first try crop substitution, led by the agriculture ministry. An estimated 12,000 families live off coca in the valley, where authorities say more than 300 labs produce semi-refined cocaine, most of it destined for Europe. The government said 54% of Peru's coca crop was produced in the area. Humala said his government would devote $214m to building roads in the valley to help farmers get alternative crops to market. 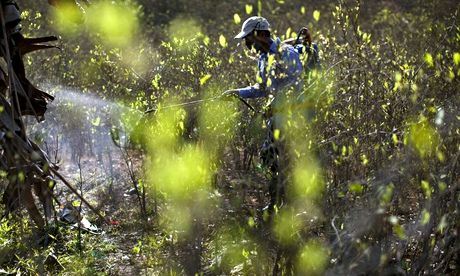 Humala, a former army officer, said that coca eradication would continue elsewhere, but the government scaling back its eradication target for 2014 to 23,000 hectares (90 square miles). Peru has been the world's largest cocaine producer since 2012, according to the US Drug Enforcement Administration, while the United Nations says its coca crop supplanted Colombia's. Humala made antinarcotics efforts a priority when he took office in 2011 and Peru cut its area under coca cultivation to 241 square miles (62,500 hectares) in 2012, a decrease of 3.4% from the previous year, according to the UN.